Over 40.000 runners participated in the 33rd edition of the AG Antwerp 10 Miles & Marathon, the biggest marathon in Belgium. At the 10 Miles, Mohamed Agourram (49:18) and Melissa Dock (58:51) took the victory. The Marathon was won by Ezekiel Kiproch Koech (02:15:55) and Ann Sofie Claeys (02:56:06). The AG Antwerp 10 Miles & Marathon is the Belgian running event par excellence. Partner AG Insurance organized the 'AG City Challenge': at least one participant from each of the 589 Belgian municipalities at the start of the AG Antwerp 10 Miles & Marathon. The action was meant to motivate even more people to move. Eventually, more than 75% of all Flemish and Brussels municipalities were represented. But the running event also attracts attention internationally; runners from no fewer than 125 countries were present, spread over the four distances. All participants in the AG Antwerp 10 Miles & Marathon are winners. And winners will be rewarded with a unique custom-made medal! The briefing of the organizer was clear: ‘Please integrate the Antwerp Town Hall.’ With a medal based on a photo, the medal is immediately unique and recognizable. Photos of buildings often produce the best results. A monument such as the Antwerp City Hall was therefore extremely suitable as the basis for the AG Antwerp Marathon medal. As a basis for the medals, the organization chose the basic colour variants Gold Antique and Silver Antique. 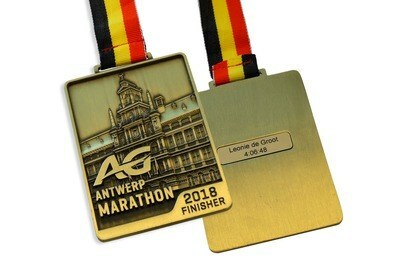 The Antique medal is the most chosen colour variant and the best choice when a photo is used as the basis for the design, as with the AG Antwerp Marathon medal. With this colour variant, the smallest details are also clearly visible. Medals can be delivered in any desired size. 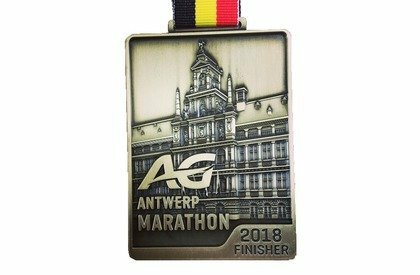 The organization opted for a 60 mm diameter medal for the AG Antwerp 10 Miles and the finishers of the AG Antwerp Marathon were rewarded with a medal of no less than 90 mm diameter. With these rectangular medals the widest point of the medal determines the size. 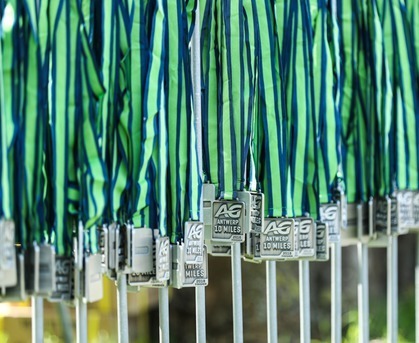 With Medaltab, the organization offers its participants the opportunity to personalize the medal with a medal inlay. Especially in long-distance running, as a marathon, it is extra fun for the participants if name and net finish time are engraved on the medal. Prior to the marathon, participants have to train a lot. A unique achievement deserves a unique medal! Medaltab offers organizers the perfect solution to generate additional income and of course the organization of the AG Antwerp 10 Miles & Marathon also makes use of this opportunity. The organization receives a cashback for each Medaltab sold, whether through registration or via a backorder on this website. And that without investment or risk!